An oft-cited aphorism to defend eating crustaceans -- or not caring about crustaceans -- is the widely-accepted notion that they simply don't feel pain like we do. While that view may be held by many, scientists are now saying that it likely just isn't true. 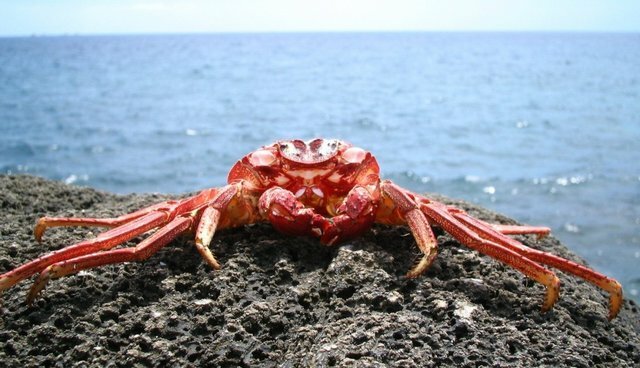 Today, The Washington Post published a review of recent research findings that support the idea that crabs, lobsters, prawns and other crustaceans do in fact feel pain. He then turned to crabs. If he applied a brief electric shock to one part of a hermit crab, it would rub at that spot for extended periods with its claws. Brown crabs rubbed and picked at their wound when a claw was removed, as it is in fisheries. At times the prawns and crabs would contort their limbs into awkward positions to reach the injury. "These are not just reflexes," Elwood says. "This is prolonged and complicated behavior, which clearly involves the central nervous system." Importantly, though, despite scores of evidence to show that these animals feel pain when they are hurt, there is virtually no legislation to protect them. "Early on in my career I realized that when the law speaks of animals, it does not mean invertebrates," Antoine Goetschel, an international animal law and ethics consultant based in Zurich, told the Post. "As long as the common opinion is that invertebrates do not suffer, they are out of the game." As Gawker points out, David Foster Wallace brought up this point in his famous piece "Consider the Lobster" for Gourmet Magazine, in which he deconstructs the ethical and moral debate about whether lobsters feel pain -- and whether we should care about that. Why is a primitive, inarticulate form of suffering less urgent or uncomfortable for the person who's helping to inflict it by paying for the food it results in? I'm not trying to give you a PETA-like screed here-at least I don't think so. I'm trying, rather, to work out and articulate some of the troubling questions that arise amid all the laughter and saltation and community pride of the Maine Lobster Festival.